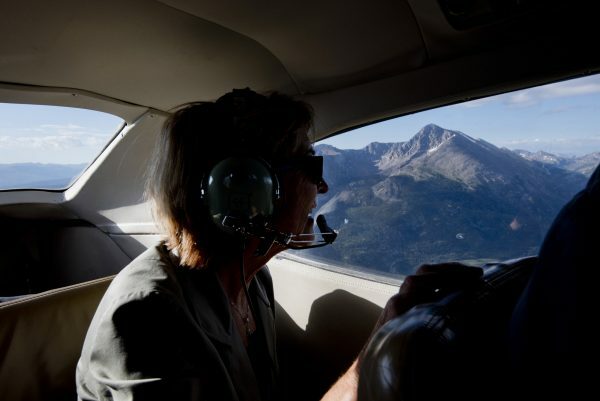 Eagle County Commissioner Kathy Chandler-Henry checks out New York Mountain from an EcoFlight flyover of the proposed Continental Divide Wilderness and Recreation Act in August (Dan Davis, Trekker Photography). 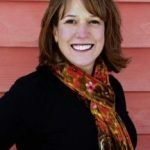 Republican Donald Trump may have shocked the popular-vote majority of the nation with his electoral college victory over Democrat Hillary Clinton Tuesday, but Eagle County continued its trend toward supporting Democratic candidates, with both incumbent Democratic Eagle County Commissioners Jill Ryan and Kathy Chandler-Henry beating their Republican opponents. Ryan beat Republican Michael Dunahay 13,463 votes to 9,322, and Chandler-Henry defeated Republican Rick Beveridge 12,295 votes to 10,637 in preliminary and unofficial voting results posted by the Eagle County at 1 a.m., Wednesday. 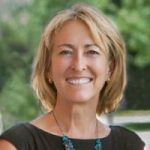 In Colorado’s U.S. congressional races (Eagle County is divided between the 2nd and 3rd congressional districts), Eagle County voters went for Democrat Jared Polis over Republican Nic Morse 3,822 votes to 1,863 in CD2, and Democrat Gail Schwartz over Republican incumbent Scott Tipton 9,301 votes to 7,392 in CD3. But statewide, Tipton decisively defeated Schwartz 54.3 percent to 40.9 percent, while Polis beat Morse 57 percent to 37.4 percent. In Eagle County’s state House of Representatives race, local Republican Michael Cacioppo lost to Democratic incumbent Diane Mitsch Bush in his own home county 13,772 votes to 9,066 in House District 26, while Mitsch Bush also won the district-wide race that includes Routt County by a resounding 60.7 percent to 39.2 percent for Cacioppo. In Eagle County, voters signed off on tax increases to better fund schools, but defeated taxes for open space and housing. Eagle County School District Ballot Issues 3A and 3B, authorizing a mill levy override and new bond issues, both passed — 12,313 votes to 8,014 (3A), and 10,771 to 9,474 (3B), respectively. Ballot Issue 1A (housing) lost 8,784 to 14,903, and Ballot Issue 1B (the open space tax extension) was defeated 11,017 votes to 12,266. In the 5th Judicial District race, incumbent Democrat Bruce Brown lost to Republican Bruce Carey 9,942 votes to 10,118 in Eagle County but won district-wide by nearly 1,000 votes by claiming victory in Clear Creek, Lake and Summit counties. Democratic treasurer candidate Teak Simonton beat Republican Mari Renzelman 14,338 votes to 8,860. In the Avon Town Council election, incumbent Democrat Jake Wolf (1,028), Democratic Mayor Jennie Fancher (959), and former council member Amy Cramer Phillips (938) won the three seats up for grabs. In the Eagle-Vail Metropolitan District sales tax campaign to fund transportation upgrades, the measure that would have raised the sales tax up to 2.9 percent on the Eagle-Vail commercial strip failed by a margin of 671 to 644. “Here in Colorado, we reject the notion that dysfunction is normal; that partisan gridlock is somehow acceptable; that Republicans, Democrats and Independents can’t work together. Our victory tonight is a testament to the fact that we can and will work together — Washington has a lot to learn from Colorado, and we need to set an example. “I want to commit to you that I will work with our Governor and our congressional delegation — no matter their political party — to look for every opportunity to reach across the aisle for the benefit of our state and to establish a model for every other state. We must put Colorado and our shared interests ahead of partisan politics. “So, tonight as we celebrate our victory, we must also commit ourselves to the hard work it will take to repair our politics and our national discourse. Commit ourselves to restore the democratic institutions generations of Americans have built and the spirit that truly makes this country great. For the very latest and most complete general election results, go to the Eagle County website.